One of the greatest achievements of Padron family cigars came in 2009, when the company received recognition for having the cigar of the year by Cigar Aficionado magazine. The Padron Family Reserve No. 45 Maduro truly combined the old tobacco flavor of Cuba with slightly different changes to the blend that made it one of the most exquisite cigars in this decade. The Padron Family Reserve was the anniversary cigar for the 45th year of the Padron company, created in 1964. The hammer on the Family Reserve cigar represents a tool given to Jose Padron by a friend to allow him to work as a carpenter, saving money for a great cigar company. The tobacco in the Padron Family Reserve comes from a long stock of aged tobacco. The No. 45 is a particularly strong blend with hearty notes and multiple spices blended with a coffee aroma. The Family Reserve truly come from a potent stock, and some of the leaves are as old as 10 years, according to Jose Padron. Padron Family Reserve cigars come in Torpedo, Toro or Robusto style and contain some of the most potent tobacco leaves on Earth. While they make the perfect gift for a cigar fanatic, they are one of the more expensive cigars that you can buy. However, these cigars come with a strength in taste, unsurpassed by other cigar manufacturers. The torpedo style of the Padron Family Reserve came from the older tobacco leaves, which used to only be for special occasions within family celebrations. However, Padron sought to share the gift of their family's farms with its many fans. 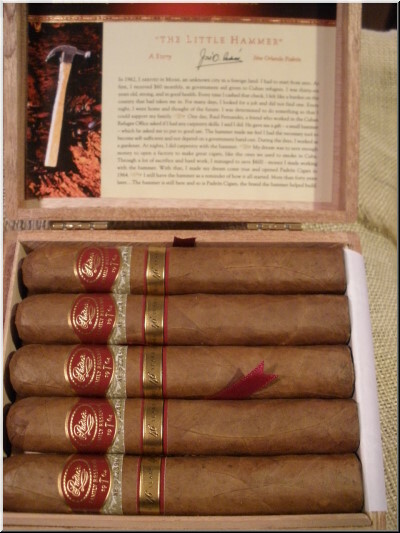 The Padron Family Reserve comes with natural and maduro wrappers that come in boxes of 10. Jose has said when making this cigar and others, that cigar making is just something in the blood, and that the Padrons truly love the business of making quality experiences for cigar lovers.